Even after an apology and a reprimand, Kentucky Equality Federation’s Southern Kentucky Regional Management today condemned the actions of a Southern Kentucky educator. South Laurel High School teacher, Ms. Kendra Baker wrote on the top of her school board “You can’t be a Democrat & go to Heaven.” Kentucky Equality Federation is filing complaints with the Kentucky Department of Education, the Kentucky Office of Secretary of Education, as well as every member of the House Standing Committee on Education on the inappropriate conduct of school officials in Clay, Grant, and Laurel Counties. “The School Superintendent reprimanded the Laurel County teacher, citing that she broke with policy regarding the environment of the classroom and we thank Superintendent Doug Bennett for his swift action,” stated Kentucky Equality Federation President Jordan Palmer. 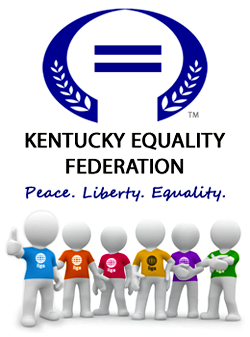 “Kentucky Equality Federation contends the objective of such a message was to scare children into thinking a certain ideology by damaging the thought process, scaring the Commonwealth’s youth, introducing partisan politics in the classroom, imposing one-sided views on the classroom and generally directing the students into confined thinking. Regardless of the origin of the statement, the teacher had the greater responsibility to remain objective. "Ms. Kendra Baker's actions during the election illustrate the divisiveness and polarization of American politics today," stated Chairman of the Board Brandon Combs. "It is my understanding that Ms. Baker is a Social Studies and Civics teacher, where discussing politics is typically acceptable. Once presented with this quote by a student, it should have immediately been disregarded as inappropriate for classroom discussion. Children should not be introduced to partisan politics or threatened with religious punishment while in the classroom. This lack of judgment is very concerning considering Ms. Baker is educating our future community leaders and work force." Don't pray in my schools and I won't﻿ think in your churches. REPORTERS/SUPPORTERS: You can subscribe to press releases by clicking here; not all press releases are submitted to every reporter. Remain informed and get exclusive stories by subscribing to our official press release feed in a browser (email delivery also available). Every day, LGBTI people are denied many of the freedoms enjoyed by other Kentuckians. We are committed to secure full equality for the LGBTI community of the Commonwealth. Your support is critical to our success. Please fund our efforts to end discrimination in Kentucky. We need your support to move Kentucky forward. We cannot do it without you! To remain informed and current with Kentucky Equality Federation alerts, news, opinions, or events, subscribe our press releases, and our official blog. 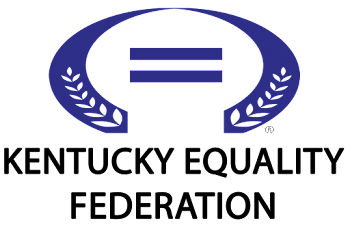 Copyright 2005 - 2017 Kentucky Equality Federation or its affiliates. All Rights Reserved. Powered by Blogger.